Welcome to the 2013 launch of DylanMalloch.com! It’s great to be back for another year. To celebrate the occasion, I thought I’d give a new format a go as a trial. My mate Steve and I traded emails discussing Australian politics which then somehow turned into a discussion on sport. Enjoy! So, let me ask, what the hell has changed here? Other than them now throwing pot shot insults at one another that would make Tamsyn Lewis and Jana Pittman blush, nothing has changed in the slightest. What’s the motivation here? Labor reckon they can get more votes by distancing themselves from the Greens? Greens reckon they can get more votes by attacking Labor? All I know is that Tony Abbott is sitting in a lounge chair, lighting a Cuban cigar, reclining in that same chair, calling over Peta Credlin and saying, “It’s working,” before laughing manically like this. This is about as much of a breakup as NAB’s with the other big banks. 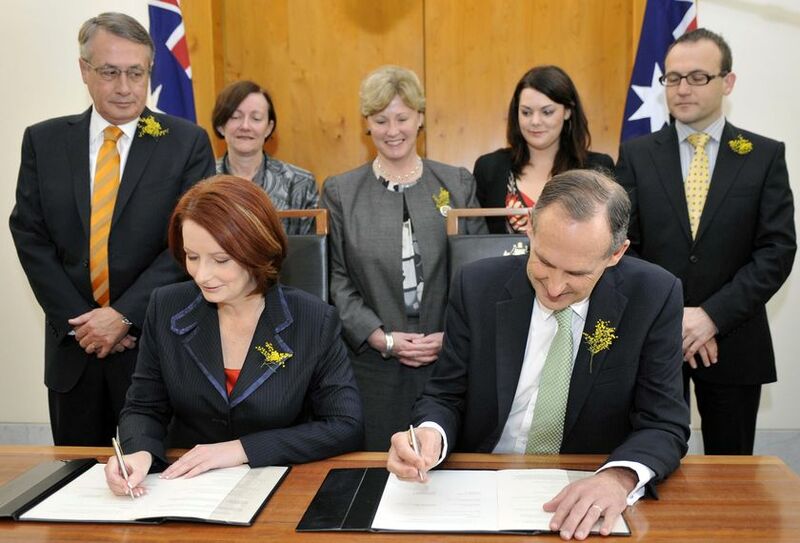 It just shows how totally unnecessary it was for Gillard to sign the agreement with the Greens in the first place. There was no way the Greens were ever going to disrupt supply or support Abbott in a no confidence motion so she basically signed up to the right to have Green stink smeared all over her without getting anything in return that she wouldn’t have got anyway. What a deal. It makes sense for the Greens to create the illusion of conflict with Labor. As Gillard says in Coorey’s article, they have always been a protest party. The certainly can’t go to their voters as the subservient part of a coalition with the most hated Government since this one and expect their vote to hold up. Instead of open season on the Greens – it’s really open season on Labor. Senior ministers retiring for the always laughable ‘family reasons’, slapped around in the polls, dismissed and derided in the media, and now dumped by Christine Milne (the ultimate insult). It will be interesting to see how many sitting ALP members campaign with brochures and flyers containing no party logo or mention of the word ‘Labor’ – always a sign of a party in trouble. I’d forgotten all about the cartoon Robin Hood! But the metaphor is quite apt given ‘Sir Robin’ built his reputation on ‘stealing from the rich to give to the poor’, shades of the so-called class warfare we’re seeing at the moment. I’m curious as to where this sudden preoccupation with successful people being required to pay their ‘fair share’ comes from. I heard a good interview on ABC News Breakfast the other day where an industry association rep defined a ‘fair share of tax’ as ‘what’s required under the law’. Otherwise, the definition of what’s fair and what’s not fair is entirely subjective. It just becomes one person’s opinion against another. Speaking of this approach though, it’s probably the thing that frustrates me the most right now about political arguing. The notion that “Not only am I right, but anyone who thinks otherwise is not just wrong, but stupid too.” K-Rudd pioneered this with his whole “The alternative is to do nothing” rationale which had as much chance of succeeding to win people over as Lindsay Lohan pleading to the paparazzi to respect her privacy. I wonder what has a bigger chance of succeeding in September though. 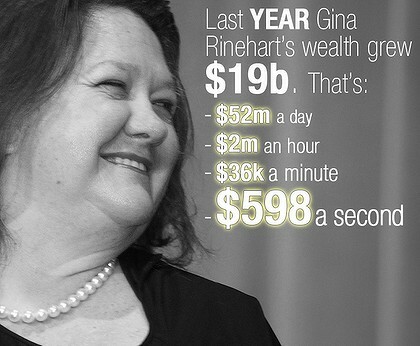 Labor winning the next election, or this movie winning an Oscar? Whoa – I cannot wait to see this movie! The class warfare is getting so out of control it’s now spread to the AFL. Demetriou must have brought Wayne Swan in as a consultant or something. Who else besides the ‘World’s Greatest Treasurer’ would come up with a system of charging more for tickets to AFL games involving successful teams? It’s only a matter of time before a Downfall parody of this gets to half a million YouTube hits. You’re right about the standard of debate, but I don’t think it’s anything new. There are no real ‘glory days’ of Federal Parliament. There is this bizarre movement to beatify Paul Keating as some sort of legendary public performer on the basis of a couple of memorable lines, but pretty much all he’s remembered for are visceral insults that are worse than any of the barbs people are supposedly so fed up with today. Case in point: The infamous Paul Keating Insult Archive. For me the most frustrating part of being a political observer is the phony nature of it all. They all seem to hate the people on their own side more than their real opponents. We saw John Howard prefer to go down with his ship rather than hand the wheel to Costello. We’re now seeing literally dozens of Labor MPs willingly torpedo their careers rather than turn to Rudd to limit the damage. Word at the moment is that there is a Combet-Shorten or Shorten-Combet ticket that has the numbers and is waiting for the right time to knock off Gillard. How must those Caucus meetings go, do you reckon? My guess is something like this. I remember being midly scandalized by Piggy’s death when I first saw that. Yeesh! And you’re spot on about the AFL and its laughable ‘tax’ on higher-profile clubs. The worst part is that the biggest losers in this whole saga are the fans as they’ll be the ones paying more. Furthermore, and this might be a sore spot for you, but to charge more to Essendon games is disgraceful as they’re only a borderline playoff team. It’s like Meatloaf coming out to Australia and charging $400 a ticket. Sure, he’s one of the biggest names ever, but his singing ability has devolved into this: http://www.youtube.com/watch?v=XZdiaFXW2U8 – check out 5:35 for the greatest part. 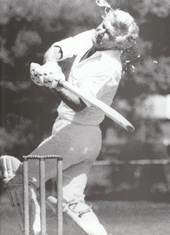 Speaking of sport, I’m in two minds about the status of cricket. I reckon it’s no longer a top tier Australian sport; rather, it’s “upper-mid tier”. By this I mean that, if there’s no competition, cricket will attract good crowds and strong TV audience. However, if it’s up against one of Australia’s big guns (League and AFL) it’ll always be relegated to second place. I noticed this when Channel 9 were already spruiking the NRL season back in the Boxing Day test… last year! They were so desperate to flog NRL that they were advertising it in the middle of the offseason while the first game was still four months away. I guarantee you won’t see any ‘summer of cricket’ advertisements in August. Hell, the Ashes is on in the middle of the year (only the biggest cricket event of all time) and Channel 9 are having to ‘share’ the broadcast rights with Fox Sports! Let’s pretend the situation was reversed though. It’s December and the Ashes are being contested in Australia. Yet, there’s some landmark Rugby League game on – say, the final between Australia and New Zealand. What gets broadcast on the main Channel 9 channel? I’m thinking the League. For Channel 9, the biggest Rugby League game would be considered more important than the biggest cricket game, even if it was in primetime cricket season. To me, that seals cricket’s fate as an upper-mid tier sport, but no longer competing with the Big Two. Richie Benaud will now light himself on fire. Cricket is on a different plane though. Unlike any of the football codes, it’s a truly national sport. The Australian cricket captain is always going to be a more well-known and influential figure than the captain of the AFL All-Australian Team (which doesn’t even play any games), the Kangaroos and Wallabies. In fact, who is the captain of the Wallabies at the moment? Cricket also has more international appeal than the football codes. Brett Lee is a god in India, Warnie gets more press in the UK than Kate Middleton’s B-cups and Ricky Ponting’s toupee is a global E-Bay phenomenon. The other thing about the so-called decline of cricket is that people think we have some sort of divine right to field a side with multiple superstars all the time. Warne and McGrath were two of the top six or eight bowlers who ever lived, supported with batting geniuses like Waugh, Hayden, Ponting, Gilchrist & Langer. Players like this don’t just fall from the sky. The Cricket Academy was a world leader in the late 80s and early 90s (and produced most of our side from about 1995 onwards), but other countries have caught up. It’s to be expected that we don’t continue to win 16 Tests in a row every other year. Speaking of Warnie, he gets it. He understands that cricket needs controversy, excitement and showmanship. His spat with Marlon Samuels was worth its weight in gold to the Big Bash League, and don’t let anyone tell you otherwise. The man’s a genius. Long live Warnie.